Oh wow, I have FINALLY found the jackpot, friends. It’s dealnews. It’s a website that collects all the latest and greatest deals online and organizes them all for easy viewing. This site is amazing! It’s especially good for electronics deals, and nabbing good prices on apparel, toys, movies and travel deals. Sweet! Take, for example, my recent quest for a good, reliable paper shredder at a good price. I couldn’t find anything, even with my browser plugin. 🙁 But here it is, found easily at dealnews. Well, I learned my lesson. 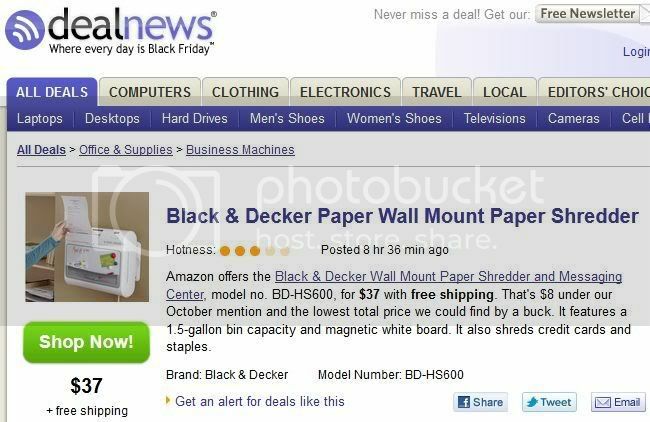 I’m definitely checking out dealnews.com first. The sales are very good, it’s like Black Friday every day. 😀 The prices on electronics are especially good– dealnews.com has a huge, huge listing of laptops, computers, hard drives, TVs, and more. If you are like me and tend to forget to check websites first, you can have dealnews.com email you deals in email alerts. You can tailor the emails to suit your deal, too– choose a particular category or a specific product or a particular store, and dealnews will email you when they know there’s a discount. That’s a very nice feature. You won’t get clobbered with unrelated emails. Nice! There’s another email feature where you can sign up to receive the “best of the best” deals, too. No more wasting money on exorbitant retail prices! Definitely check out the site. It’s totally free to use and there are no hidden charges or sneaky sales maneuvers. This is a great site and has become my favorite “go to: site before I shop. Check out the site yourself and come back and tell me what great deals you found! I am a big time price comparison shopper and always read reviews before I buy anything over $10. You have to especially if you are on a budget. You want to get the most bang for your buck. Thanks for this tip! I am checking out the site in my other window. I noticed that they don’t have household goods or furniture listed but hopefully they will soon! I am looking for a good vacuum cleaner. I used to always buy the cheapo ones but they always broke. I realize now that I do need to spend a little more money. Scratch that, I just found the Home & Garden selection on the site…its under Electronic and then select “More”.